Have you ever experienced habitual conflict with a loved one that seemed unavoidable and unsolvable? Have you ever gotten stuck in negativity from comparing yourself with others? Have you ever felt stuck in unhealthy choices without the energy or direction to change? Of course you have, because we all have. Understanding your personality will help you unravel tensions and unproductive behaviors faster than anything. Not only that, if you also know your spouse’s, children’s, or mother’s personality, then those seemingly unavoidable conflicts can be quickly diffused – knowing the personality patterns shows the way to choose understanding and appreciation over conflict and turmoil. Geeking out on MBTI typing can be an awesome way to waste a day or a week, but so much of it is based on career advice or the work place that it’s difficult to see how it applies to moms at home, raising children. But what we have is a personality hotbed. We need to work in line with, and not against our own personalities. Sometimes that means going against “common wisdom” or received practices – and sometimes it doesn’t. We need to account for each child’s personality, and help each one develop his own strengths, rather than try to make them conform to our own. We need to be effective and wise counselors, guiding our children and our friends (not to mention ourselves) toward greater understanding, maturity, and kindness. Knowing personality typing gives us the vocabulary to talk about each other’s strengths and weaknesses with sympathy and grace. With new categories in our minds, we can better interpret the dynamic playing out in our homes and address it effectively. Instead of escalating or ignoring conflict, we can see the path of resolution. 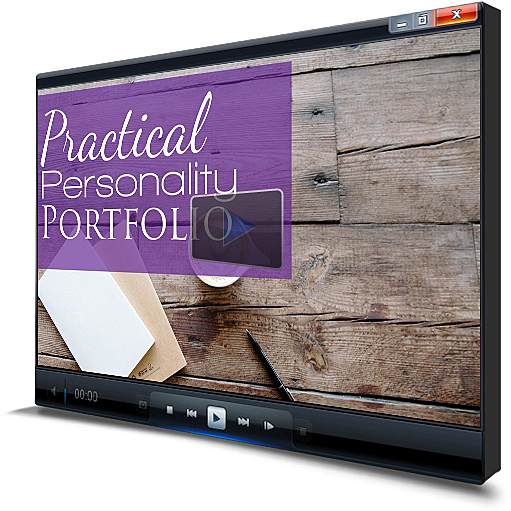 That’s why I’ve put together this Practical Personality Portfolio. Understanding not only my own type, but also the types of my family members has helped me make wise choices in how I handle situations, how I plan our homeschool, and how I treat each child. I have talked to so many other moms who, once we unravel the personality differences in their home, have been able to troubleshoot and problem-solve their own situations from a place of grace and understanding rather than a place of frustration and bewilderment. 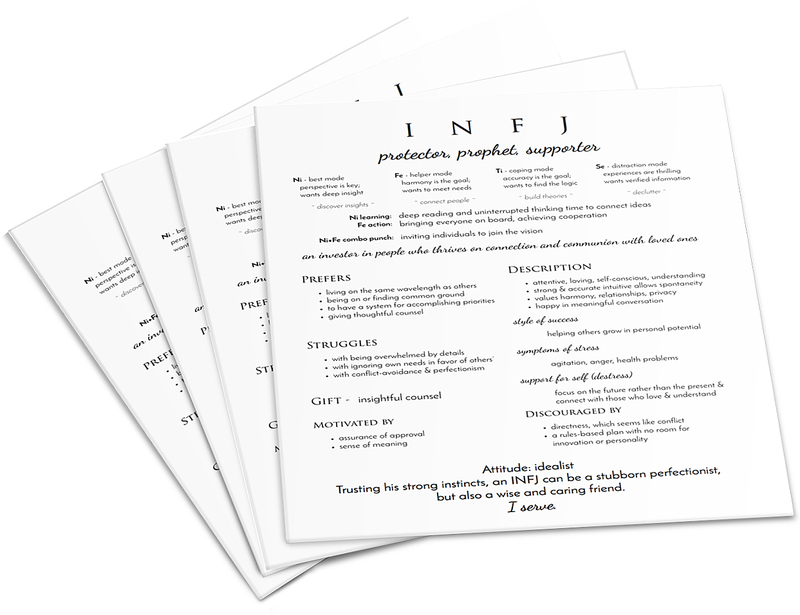 a 13-page handbook explaining in simple and straightforward terms, with clear and insightful charts, not only the four-letter system of Myers-Briggs personalities, but also the underlying meaning: cognitive functions. Cognitive functions are the real key to unlocking the dynamic of each personality type. With this handbook, you’ll be able to work out personality types without silly online tests. 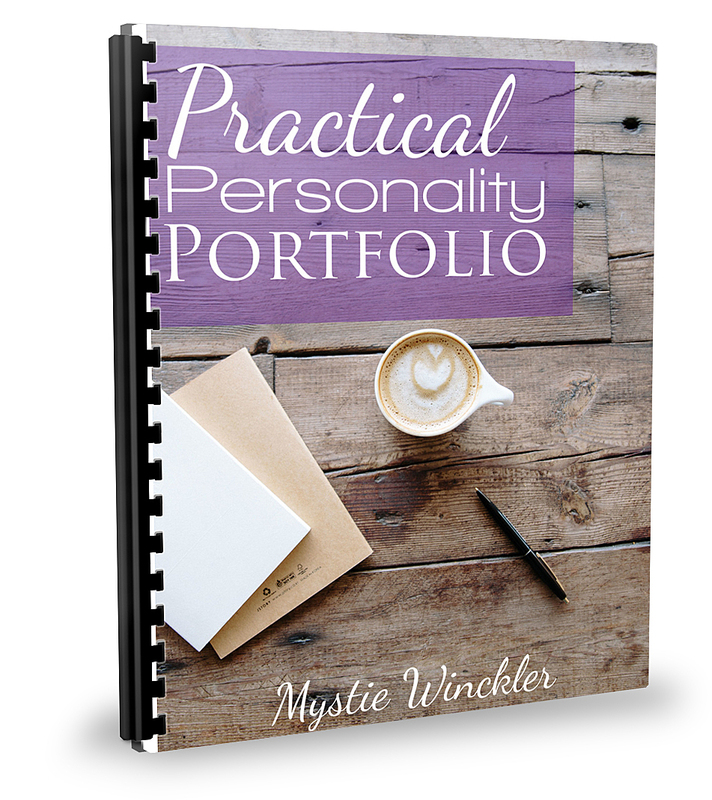 a profile page for each personality that is both highly detailed and concise. In an easy-to-read format, these profile pages will give you a cheat-sheet to understand how to work with and appreciate each type. a workbook to walk through figuring out your own type and the types of your kids, without the silly questions on subjective tests. a one-page reference for applying cognitive functions to your child’s learning. 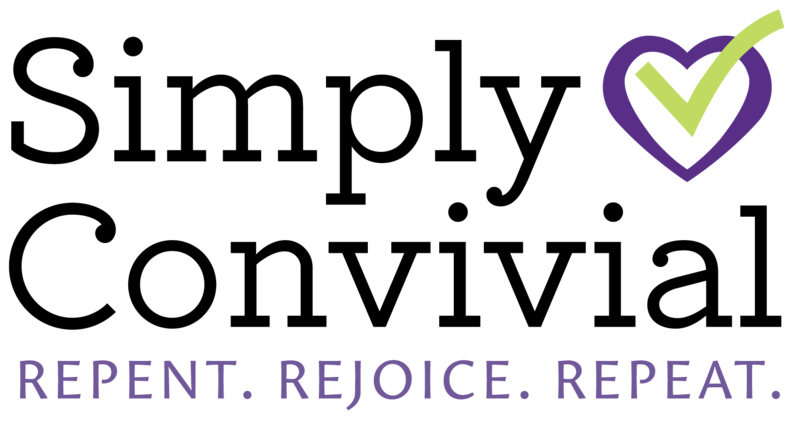 an ever-growing online resource page with links to all my articles and podcasts on personality, video explanations, FAQs, and an annotated bibliography. Thank you, Mystie, for creating such a helpful resource! I’ve been learning bits and pieces about MBTI for the last little while, but I love how you have made it so simple for me to understand! This helped me type myself and my husband. I’m still uncertain about my children, but it has already helped me to understand myself and my marriage better. This is what finally enabled me to confidently type my oldest child, which has already been super helpful to me because he has such a different personality than me. This was totally worth the money, and my other kids aren’t even quite old enough to type yet, so I’ll get lots of use from this for years to come! I’ve been a fan of MBTI personality typing for years, but I have benefited greatly from Mystie’s unique presentation of not only the 16 types (without resorting to unhelpful stereotypes) but also of the rationale behind them. 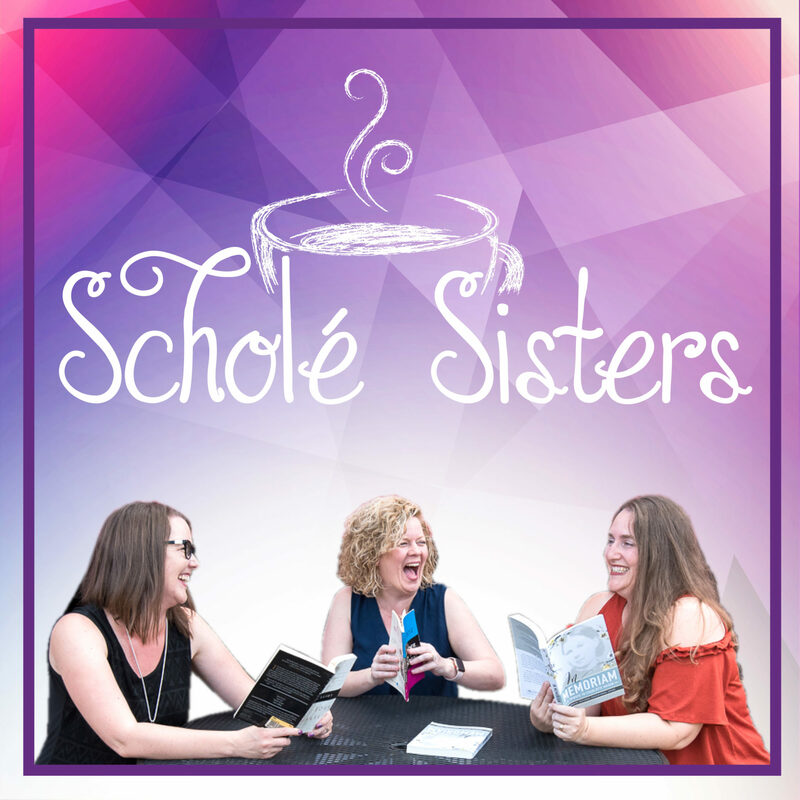 Getting the low-down from another homeschooling mama makes it hugely accessible for me and I have found it a great help in figuring out how to respond to and nurture one of my children who is quite the opposite of my type. The insight Mystie gives into the different cognitive functions is incredibly helpful in navigating the confusion sometimes caused by online MBTI tests (as well as the descriptors of each personality type). She gives a thorough breakdown of the different aspects of each personality type, as well…which is fantastic once you figure out your type.